A No 10 spokeswoman told the Telegraph: “The prime minister welcomed His Majesty the Sultan of Brunei to Chequers this morning. They agreed to renew a long-standing agreement to station UK troops at a garrison in Brunei for a further five years. Brunei gained independence from the United Kingdom in 1984. Britain then agreed to continue to station an infantry battalion in the Sultanate, a deal which is renewed every five years. The UK has maintained a contingent of Gurkhas in Brunei since 1962. There are currently around 2,000 personnel based in the country. The meeting comes after a Conservative Party fundraiser auctioned off a stay at the Park Lane Dorchester Hotel, which has been owned by the Sultan of Brunei since 1985. 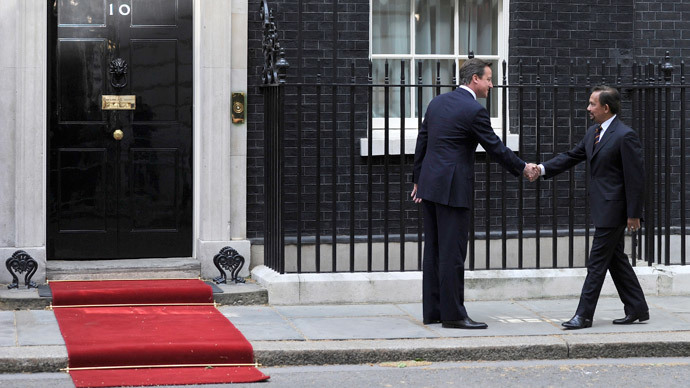 Cameron and the sultan also discussed action against extremists, including the Islamic State. In April last year, the small country on the north coast of the island of Borneo in Southeast Asia introduced a tough Islamic penal code. The leadership announced that Sharia punishments, including severing of limbs for theft and death by stoning for adulterers and homosexual acts, would be adapted over the course of three years. Brunei already has strong Islamic laws in place, including the banning the sale and consumption of alcohol. Brunei's civil courts are based on British law, inherited from the period when the sultanate was a British protectorate. Its Sharia courts were previously limited to family matters such as marriage and inheritance. The UN urged Brunei to delay the changes so they could be reviewed for international human rights standards. “Under international law, stoning people to death constitutes torture or other cruel, inhuman or degrading treatment or punishment, and is thus clearly prohibited,” Rupert Colville, spokesman for the Office of the UN High Commissioner for Human Rights, told a news conference last April. After the announcement, a number of celebrities announced a boycott of the sultan’s hotel in Mayfair.